(Left to right) A better decelerator for planetary landings, laser beams for sending data and a more accurate atomic clock are three technologies NASA's space tech office will focus on in 2013. In this belt-tightening time, few federal agencies will see more money for 2013 than they are getting in 2012. But while the Obama administration's budget request for NASA is slightly down overall, the agency's space technology program is set for a boost. NASA's 2013 budget request, which totals $17.7 billion and was announced Monday (Feb. 13), sets aside $699 million for space technology development, a 22 percent increase from what the office is expected to spend in the current fiscal year, which ends Sept. 30. The only portion of the budget in line for a greater increase is dedicated to updating or demolishing labs and launch sites. "We're going to be conceiving, building, testing and flying technologies that are required for NASA's missions of tomorrow," NASA's Chief Technologist Mason Peck said in a teleconference with reporters Monday (Feb. 13). "We are very pleased that the Congress and the administration are in agreement about the value that technology investment brings to NASA and the nation." Alex Saltman, executive director of the Commercial Space Federation, an industry group, called the continued funding of space tech "critical." 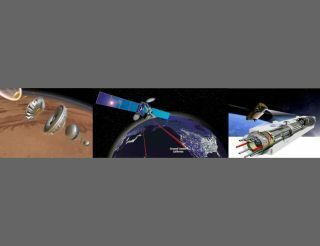 "Without these technologies, NASA will be stuck with 20th-century capabilities while advanced spaceflight technologies take root in space programs overseas," he said in a statement. With Congress' approval, the greatest portion of NASA's federal funds for technology will go to a program that supports early- to late-stage technologies that meet the space agency's needs. One project Peck and NASA's director of space technology programs Michael Gazarik emphasized is an optical communication system that would send data zipping through space as a laser beam. The beam would transmit information 10 times more efficiently, Peck said. Several government agencies besides NASA are interested in the system, and it eventually will be useful to people at work and at home, too, Gazarik told InnovationNewsDaily, a sister site to SPACE.com. NASA will begin testing the space lasers on Earth in 2013, according to a budget description. Besides general space technology, the budget request specified money for getting people beyond low-Earth orbit to the moon, Lagrange points, near-Earth asteroids and Mars. In that point, the request agrees with a recent National Research Council report, which suggested NASA's space tech focus on human exploration as a new frontier. Overall, the president's request shifted funds away from the space agency's current robotic planetary exploration programs, which stands to suffer a 20 percent cut, to the human exploration of space in the future. The Office of the Chief Technologist also will spend about a quarter of its budget on partnerships and competitions for small businesses. Most of the companies that join NASA's small-business program have fewer than 24 employees. The budget document argued that research into space technology creates high-quality jobs and advances tools that consumers may use in the future. It cited solar energy materials, and protective gear that was designed for astronauts but made its way to police and fire departments. "It's an investment in the innovation economy of the country," Gazarik said. This story was provided by InnovationNewsDaily, a sister site to SPACE.com You can followstaff writer Francie Diep on Twitter @franciediep and InnovationNewsDaily on Twitter @News_Innovation or on Facebook.